Wonderful evening celebrating the Norfolk Community Foundation's 10th anniversary. The event brought together donors, charities, businesses, supporters and the wider community to reflect and celebrate the achievements of the foundation. They are part of nelsonsprit's Future Leaders Fund. The event was hosted by Carol Bundock (ex BBC journalist) and featured Charles Barratt (Chairman of NCF) opening the evening followed by videos reflecting the achievements and developments over the last 10 years. The Rt Rev Graham James, Lord Bishop of Norwich & joint patron of the Norfolk Community Foundation reminisced about the start up of the foundation, praised the support given to the foundation and his love of the community of Norfolk. 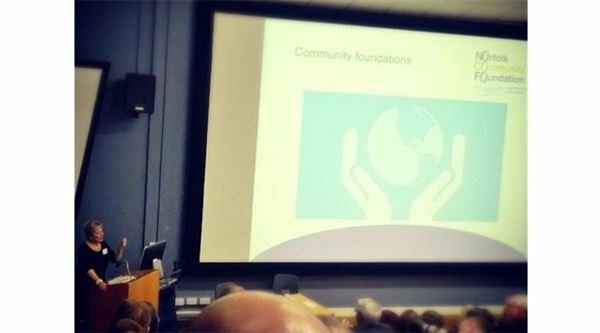 David Sheepshanks (Chairman of UK Community Foundations) delivered an inspiring talk on how community foundations nationwide are aiming at growing and developing. He celebrated the successes of the foundation network and highlighted the key fact of how philanthropy develops communities as a whole. Carol Bundock hosting the celebration evening.